The take-anywhere, play-anything Traynor TVM10 Travelmate successfully mixes versatility with portability and typical Traynor reliability. 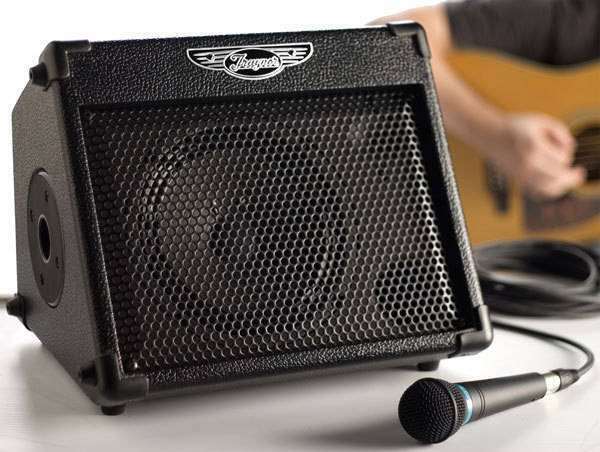 Perfect for small gigs, rehearsals or street corner concerts, the TVM10's two-channel, 3-input design allows quick connection to a microphone, instrument and CD / MP3 player. Individual volume controls on the two input channels and four-band master EQ makes the TVM10 a complete and ultra-compact sound solution even if you only want to practice in silence (the Headphone jack disconnects the woofer and tweeter when you plug in). Meanwhile the rechargeable battery lasts for several hours even with the TVM10 running at high volume levels. The cabinetry is also versatile. The TVM10's wedge monitor shape projects to an intimate audience from ground level or, mounted on any regular speaker stand via the built-in adapter, it doubles as a micro-PA for added audience coverage. • Channel One - XLR / 1/4-inch TRS Combi-jack Microphone Input with Volume Control for quick connection to any line or microphone source. • Channel Two - 1/4-inch Line Input with Volume Control, ideal for any instrument including acoustic or electric guitars and keyboards. Additional RCA Auxiliary Line Input for quick connection of any CD or MP3 player. • Built-In Rechargeable Battery Pack Power Source - The TVM10 can run anywhere no cumbersome AC power source required. 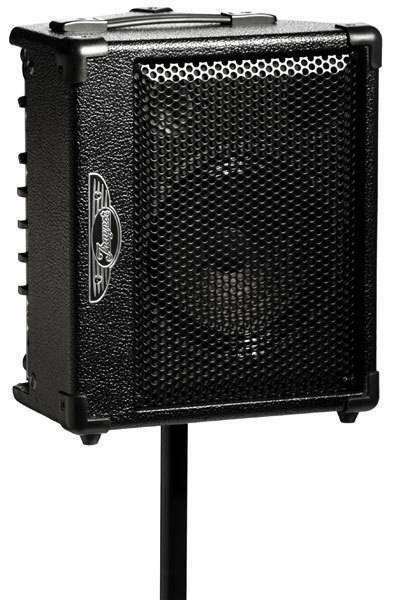 • Unique wedge cabinet shape projects to an intimate audience from ground level, or allows the TVM10 to act as a wedge monitor for rehearsals. • Integrated Speaker Stand Adaptor - Allows quick solid connection to any standard speaker stand when TVM10 is used as a small announcement PA or background music playback system. I was wondering if anyone new what kind of speaker would fit and go well with this amp. 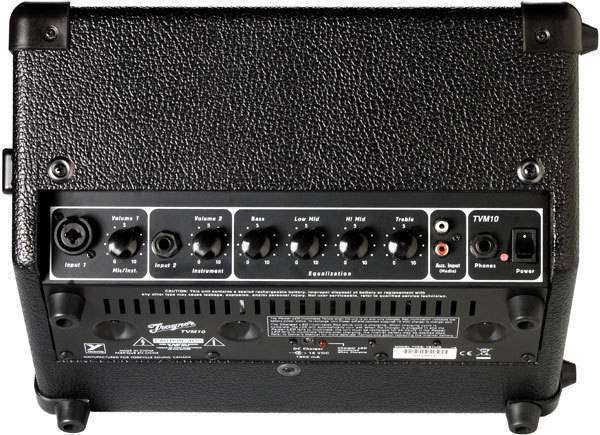 i want to usse it as a vocal and guitar amp. I have owned this amp for over four years now. I had doubts about how long it would hold a charge. I had it sitting for months without use during a move and plugged it in and it still had lots of power! For its size it has lots of power. I had to look up the specs because I couldn't believe it only had a 6" speaker in it. I should have bought one of these years ago. This is as must have for the active musician. This little box is so versatile, can be carried everywhere, the battery lasts many hours on a single charge. I often use it as a monitor on small gigs when all instruments are plugged to the P/A and we don't have space for regular full-size monitors. Perfect for busking with its XLR inputs. People keep asking me to borrow it... One minor flaw: the tolex covering tends to curl up with time, like if the glue has lost its sticking power. Mine is over 6 years old. I've had mine for at least 7 years now. Never any issues. Holds its charge like a champ. Is loud enough as a practice/back yard jam amp. It's also my secret weapon for small acoustic jams when I plug my U-Bass into it. Not cheap but more versatile than my Pignose. Total clean sound with two channels and decent EQ options. If/when this thing ever craps out, I would definitely replace it. I have been using one for years. Everywhere I take this little amp people find it very handy! I use it for busking or places where there is limited access to electrical power and it always served me well. I also use it as a monitor. It can go for hours and hours of use on a charge. Something every musician should get. 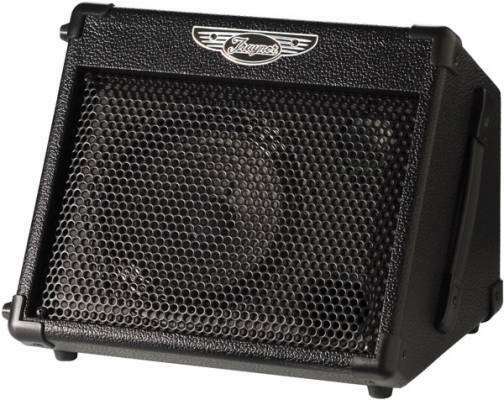 I use this great little amp as a stage monitor and it works really well for this purpose. Plenty of volume and excellent tone control. I find that I get much more volume if I use an XLR input line (from a mixer) to channel one's combo plug. Great feature set, lightweight, holds a charge amazingly well. A little boxy sounding but it is what it is. The mid-range tone make it cut thru tho. The power supply that comes with the TVM10 is a poor design. The wire breaks too easily. Not easy to find a replacement for that power supply that lasted about 1 month. Lots of punch in a small package. I like the multiple inputs and connectors. Very nice sound for such a small enclosure. A very versatile device to carry around. To the reviewer who complains about the buzzing sound while charging: you are not supposed to use the amp while charging! Read the manual. I've had mine for several years and haven't had any problems. I'm still on the original battery and find it holds it's charge really well. One overnight charge and I'm good for easily 8 to 10 hours of use. I have a few issues with this amp. First of all, you cannot plug it directly into the mains. The power cord just charges the battery, during which time there is an awful buzzing sound. Second, it has two RCA input jacks, but no output jacks. Wouldn't output jacks be more useful than input jacks, for, say, recording a session? Not only that, the RCA jacks have no volume control (and there is no master volume), meaning whatever device you plug into them better have its own volume control. For such a small unit it is packed with power and I like the ability to plug in a mic and an acc. such as iPod. This little amp rocks. Light, portable and enough power for small venues or practices.